Increasing evidence has shown that chemokine receptors may form functional dimers with unique pharmacological profiles. A common practice to characterize such G protein-coupled receptor dimerization processes is to apply bivalent ligands as chemical probes which can interact with both receptors simultaneously. Currently, two chemokine receptor dimers have been studied by applying bivalent compounds: the CXCR4-CXCR4 homodimer and the CCR5-MOR heterodimer. These bivalent compounds have revealed how dimerization influences receptor function and may lead to novel therapeutics. 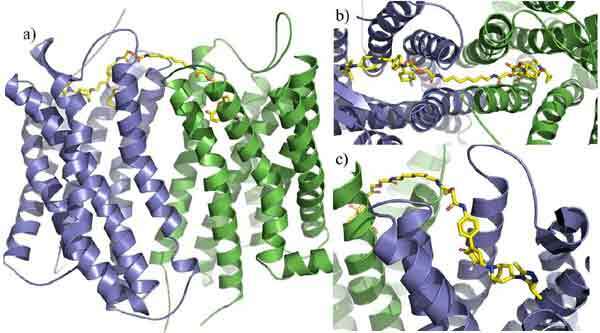 Future design of bivalent ligands for chemokine receptor dimers may be aided with the recently available CXCR4 homodimer, and CCR5 monomer crystal structures by more accurately simulating chemokine receptors and their dimers. Bivalent ligand, CCR5, chemokine receptor, CXCR4, dimerization, GPCR, MOR. Department of Medicinal Chemistry, Virginia Commonwealth University, 800 East Leigh Street, Richmond, VA 23298, USA.